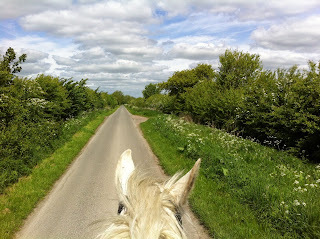 A new horse arrived yesterday and as usual her photos are going up on today's blog. 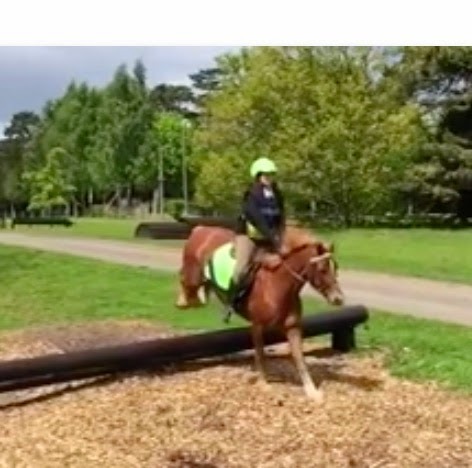 She's different from the last few arrivals we have had (though very similar to many horses who have come here in the past) as she is a thoroughbred with classically flat feet. 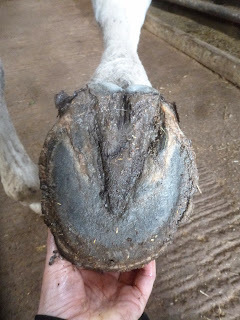 Along with a weak palmar hoof come under-run heels and long toes - something which is extremely difficult to remedy with shoes. She has a better frog than you might expect from the previous shots which is a very good sign. This is where the problems are of course - heels and digital cushion both under-developed but that is something I would expect to start changing fairly quickly. On MRI she was shown to have navicular and coffin bone changes, worse on the RF, and some navicular bursa inflammation. This in itself isn't surprising given the lack of structure in her palmar hoof but its encouraging that she has little soft tissue damage. Again, a flat foot though not quite as extreme as the RF. Once again her frog is cause for optimism as a functioning frog is an essential first step to improving feet! 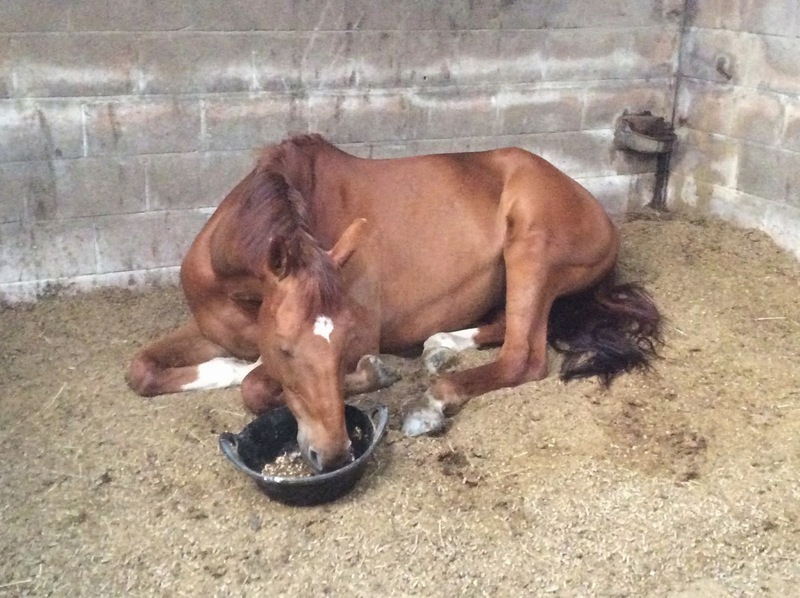 New boy Max, another Belgian warmblood, arrived yesterday. 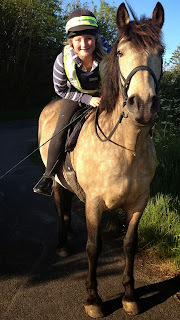 He was, like many horses, in remedial shoes but that wasn't the biggest worry for either his owner or me. The issue we had was that Max in the past hasn't been able to be safely turned out with other horses so his first day was going to be a challenge for all of us. First of all, Max had to be filmed and photographed and once we'd assessed his movement his shoes had to come off. Bar shoes always make it difficult to assess the health of the underlying foot, particularly the frog and heels, but out of shoes things became a lot clearer. Not too bad a foot - there is some medio-lateral imbalance but the frogs are a lot healthier than I thought they might be which is always a good starting point. It will be interesting to see how Max's feet change over the next few weeks and as usual I will post new photos in 3 or 4 weeks. And now for the moment of truth; unshod it was finally safe for Max to meet my boys, Felix and Charlie, who are always on duty meeting and greeting the new arrivals. They are incredibly good judges of character and Max ticked all the boxes by being equally polite to them. So he has taken his first steps towards better feet and a better social life - not a bad day's (and night's) work. I ran out of time last week to post Lad's 4 week update photos but here they are finally. Lad arrived in shoes of course and its always interesting to compare the profile of the foot in and out of shoes. Out of shoes his toe has shortened and he actually has more support for his palmar hoof when you contrast where the branch of the shoe ended. 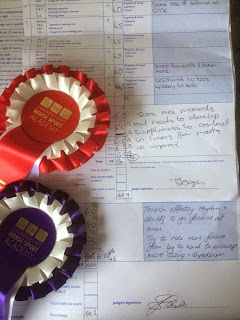 Sorry about the mud - he had been groomed but I grabbed these when he came in off the track for his tea. Again, a shorter toe and in fact a better hoof pastern axis than he had in shoes - which in my experience indicates an improving palmar hoof. These photos both show him on day 1 - in shoes and immediately after they had come off. Today his foot is a lot different with a better frog and heels, healthier sole and less distortion at the quarters. ...and 4 weeks later. 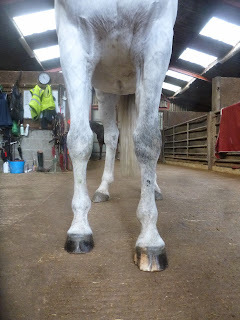 Of course Lad's feet will carry on changing for at least the next 5 months or so as his new hoof capsule grows in. His heels need to come further back, for instance, and his bars need to strengthen but that will happen in due course. The most important changes are happening at the back of the foot, with improved digital cushion depth now he is able to land heel first. Its a familiar theme of course on this blog but it never fails to thrill me when I see feet getting better! 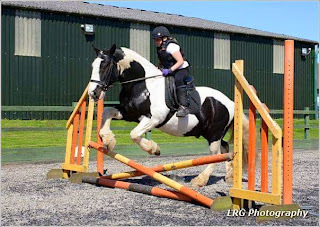 One of the best bits of any weekend is hearing about what the former rehab horses have been up to and at this time of year there is so much going on it can be hard to keep up! Lots of them have been out hacking, like Alfie and Will, making the most of a perfect spring day and building "mighty" hooves, as Will describes them, at the same time. 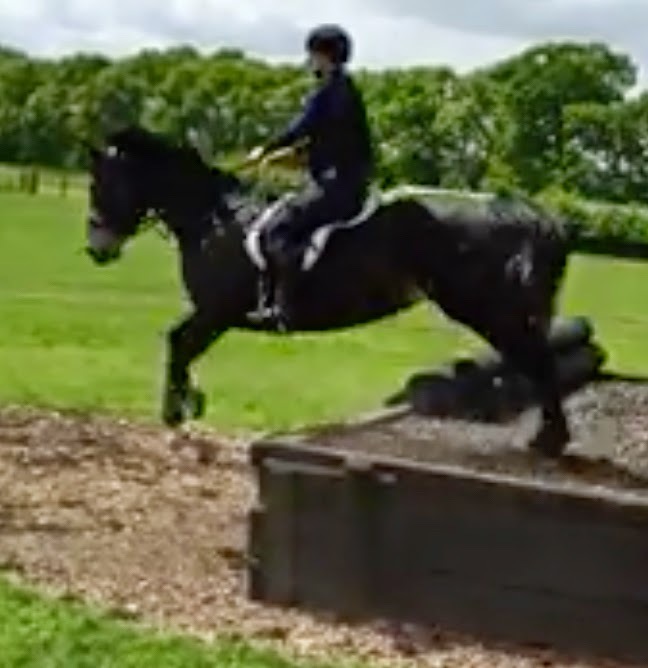 A whole posse, including Holly and Claire (above), Prince and Fiona (below) and Isla and Becca, went XC schooling with a picnic - surely one of the best ways to spend a day?! One of my favourite video clips of the weekend was of Danielle and Ginger blasting over a course of jumps. Ginger was here 4 years ago and is now 22 yrs old but he still absolutely nailed it. 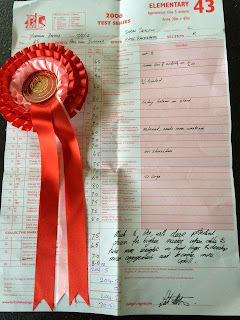 Kate and Rolie had an incredible day: "Rolie totally smashed it at Yorkshire Dressage today, 70+% in our Elementary test. Something I never thought we'd achieve - so proud of him!" What a hero he is! Very often I read owners or vets describing hooves as if the problems the horse has with them are inevitable. "The hooves are [under-run, thin-soled, boxy, upright, turned-in, flat, brittle or whatever]" is said in rather the same way as "the horse is bay" or "the horse is a gelding" - thats just the way it is, he'll never change. When describing hooves, people almost always leave out the critical caveat: "at the moment". The point is that hooves are dynamic - no matter how they are "at the moment" they can be very different in 6 months time provided that you enable the changes the horse needs. I rarely have the chance to show time-lapse photos of hooves over 6 months (roughly the time it takes for a horse here to grow a new hoof capsule) but Goofy has been here since November and its a perfect opportunity to show what I mean. First off, compare his stance on arrival (above) with how he stands today. 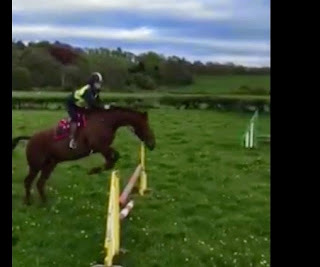 To me he is balanced and solid on his feet now - he looks confident that he knows where his feet are and that they are doing the job for him. When he arrived he had been diagnosed with bilateral DDFT tears, worse on this, his LF. 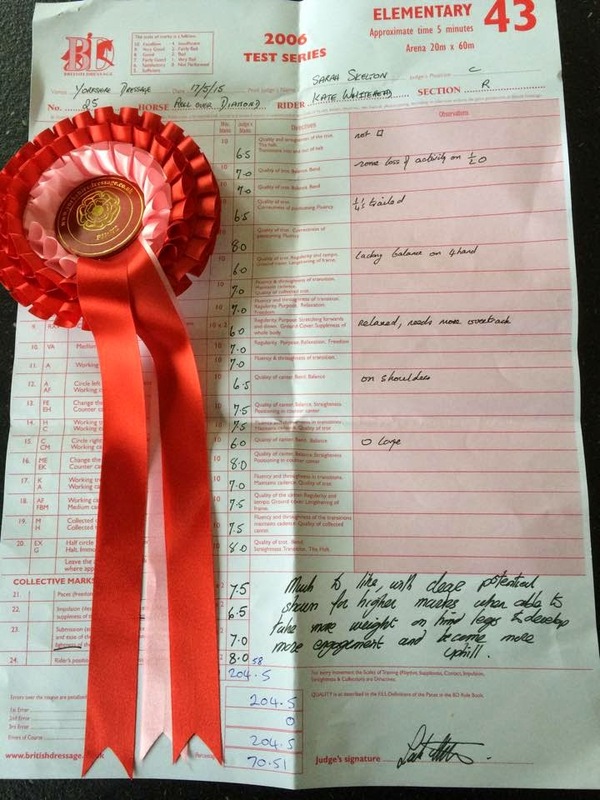 He'd had surgery and box rest and his lameness had improved but was still evident. His feet were far from the worst we've seen but they were fairly flat and the palmar hoof was weak, particularly the frog which had a central sulcus split. Today he has a much more business-like foot. There is better concavity now that his new hoof capsule has fully grown in and old abscess damage, which he had on arrival, has also gone. Again the biggest change is the much more robust palmar hoof - the frog is visibly tougher and the heels are less under-run. The caudal shot gives the clearest indication of what has changed. If you look at the digital cushion in the photo below, when he arrived, the hairline is sloping inwards towards the frog; there is very little internal strength and this foot has a limited ability to shock-absorb. Today the digital cushion is more developed and better able to provide support - instead of sloping the hairline is more level - not perfect but improved. Looking at the LF the central sulcus split is obvious. This is the sort of problem which is extremely hard to get rid of - sometimes the best you can do is keep it clean and the infection at bay. This is usually enough to allow the horse to begin to land heel-first which in turn allows the frog to strengthen. The split is still here but is not causing him ongoing problems - his landing is good and he is in consistent work - Goofy featured in the Road movie blog last month, for those of you who visit regularly. Time lapse shots from the lateral side also show changes - not as dramatic as some we see but interesting nonetheless. The most significant differences I think are the stronger digital cushion - more bulk above the hairline - and better hoof/pastern axis in the lower photo. As with the first photos, its his stance which is the most improved here. 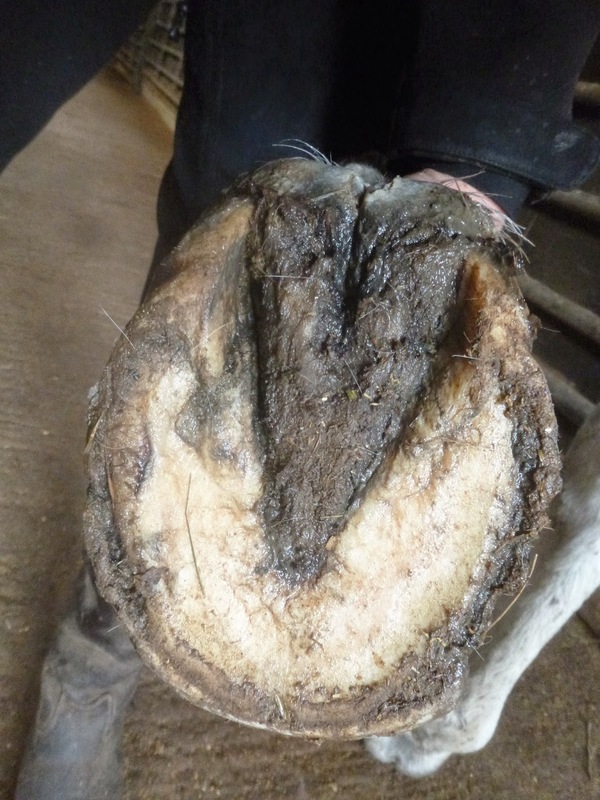 A better digital cushion leads to a stronger palmar hoof and that in turn leads to a better hoof/pastern axis are clear too. 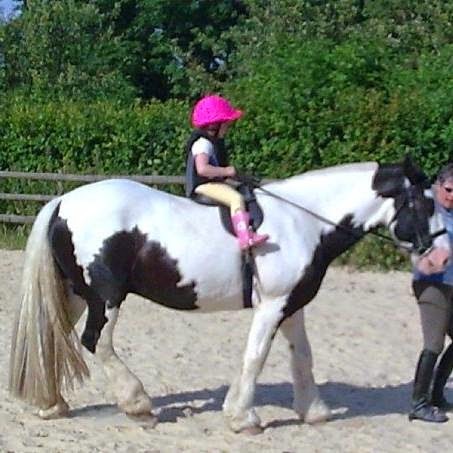 Overall its just a more supportive, more balanced foot which means he can load and use his front legs properly, meaning a sounder, happier horse.